Finally a collection of bonsai trees that requires absolutely no maintenance. 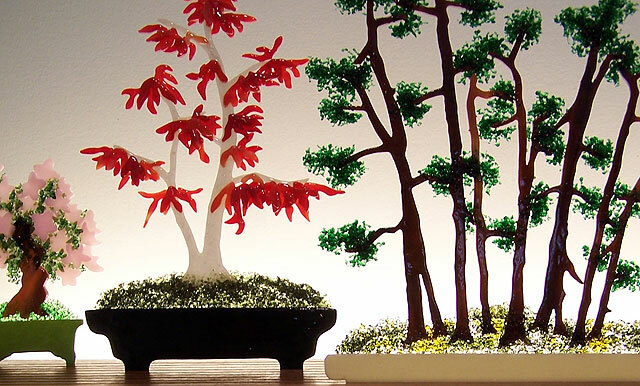 Made entirely of a wide variety of kinds of art glass and kiln-fusing techniques, Bonsai offers six classic bonsai styles: (from left to right) a semi-cascade pine, a miniature rhododendron, a "sokan" (father-son or mother-daughter) Japanese maple, a juniper grove, a root-over-rock ficus, and a windswept juniper. Also executed in glass are a selection of bonsai pot styles, leaves, needles, tree barks and mosses. The sculpture is illuminated day or night by a light, recessed into the rear of the hardwood base, which is reflected off the wall behind. Limited edition of 25. Dimensions: 47" (sic) long by 8" deep by 13" high.